At FK Floor Sanding we know how important the wood floor can be. They add atmosphere and warmth to a room and, in many cases, increase the value to a property. However, a neglected wood floor is far from being a thing of beauty. Floors that have been painted, scratched, allowed to get very dirty, are badly finished or simply neglected require expert care to restore them. Our experts look at whether the floor only needs a professional cleaning or if there is damage that sanding and finishing won’t address. In the latter situation a course of action will be suggested and a cost estimate will be provided. It is up to the client as to whether or not he or she wishes to proceed. This process begins with sweeping or vacuuming the floor to remove any loose debris. After that we use cleaning agents that are specifically for cleaning wood and floors if this is called for. The floor surface must be grit free, especially if buffing or sanding is going to be done. Buffing is also sometimes referred to as “screening”. Plainly put, buffing gives the floor a light sanding. It is very effective if one wants to gently remove the top layer on the floor. This serves to expose the original finish underneath it. Buffing leaves the floor covered in a layer of fine dust that dulls the floor’s appearance. In order to see the floor better and re-assess its condition one must remove that dusty layer. The most effective method is to use a vacuum cleaner with a suitable, soft attachment that won’t scratch the floor. When the floor is examined again after the dust has been removed further work on the floor may be required. For instance, if the finish is damaged or there are gaps between the floor boards this needs to be addressed. If the finish or surface of the floor is stained, patchy or scratched sanding becomes necessary. Where there are gaps between the floor boards our experts discuss repair options with the client. If warranted, we will fill these gaps. The staining of a wood floor may also not be wanted or needed. If the finish is still in good condition and the client doesn’t wish to change the colour of the floor the step is omitted. The form that wood floor finishing takes also differs from job to job. It is determined by the state of the floor and the client’s wishes. 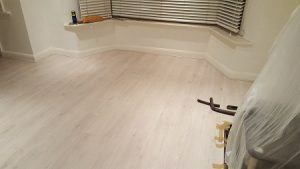 For further information about our wood floor restoration in London, or to book an appointment to for an assessment anywhere in London, please call 020 3909 7641.